They are named for the coldest, most unforgiving side of a mountain. They have helped explorers reach the most unfathomable heights of the Himalayas. But The North Face legend begins, ironically, on a beach. More precisely, San Francisco's North Beach neighborhood, at an altitude of only 150 feet above sea level. It was there in 1966 that two hiking enthusiasts resolved to follow their passions and founded a small mountaineering retail store. Through the 1970s, The North Face brand cherished a following amongst avid outdoor athletes and began sponsoring expeditions to some of the most far-flung, still largely untouched corners of the globe. This launched a proud tradition which continues in full force today and constantly reinforces The North Face mantra, Never Stop Exploring™. There's little telling what the next several years holds for The North Face company. However, there is one bedrock certainty: The North Face will maintain an unwavering commitment to pushing the limits of design, so that you can push your limits outdoors. Never Stop Exploring. Here is a brief history of The North Face. Apparel Search will not list all accomplishments, but below should give you a nice recap of the history. North Face begins a small retail and mail order operation in San Francisco's North Beach area. The Grateful Dead play at the store during celebrations. The North Face dream begins, with a few sewing machines manufacturing the first gear in the back of the store. The Sierra parka hits the market and becomes a classic in down outerwear. The North Face factory opens in Berkeley, CA. Credence Clearwater Revival serenade while rehearsing next door. In the era before the Alaska Pipeline, Ned Gillette and team make a 30-day traverse following 300 miles of the Koyukuk and Itkillik Rivers. Yosemite legends Jim Bridwell and Kim Schmitz nail a new route up the biggest wall in Yosemite. This becomes the first of many The North Face-backed firsts on the Californian monolith regarded as the finest big wall on earth. Morning Glory tent is introduced. Geodesic dome tent designing replaces the traditional A-shaped tent, with introduction of the Oval Intention. Presaging the Al Gore era, The North Face inaugurates this award for the entity contributing most to ecological destruction. Atomic Energy Commission wins. Ice Nine is an end-of-the-world science-fiction concept in a Kurt Vonnegut novel. The VE-24 tent unleashed! Embodying R. Buckminster Fuller's theory of sphericity incorporating maximum efficiency with minimum materials, this design remains little changed after 30 years. Touting the t-shirt slogan "A woman's Place is on top", a 13-woman American team make an ascent. Leader Arlene Blum writes the classic expedition book "Annapurna: A woman's Place." Jim Bridwell and Andy Embick climb a new route on this wilderness peak. Bridwell pioneers new technology for climbing by using neoprene clothing, to withstand the constant pour of ice water flowing down the wall. Galen Rowell, Kim Schmitz, Ned Gillette, Dan Astay travel 300 miles of glacier in this marathon winter ski-trek. A multi-sport journey, circumambulating the world's tallest mountain, skiing, ice climbing, and hiking. Team includes the redoubtable Ned Gillette and Jim Bridwell. Using an ice breaker ship, snow-tractors, rafts, and hiking boots, a team led by Britain's Sir Ranulph Fiennes circles the globe, via the North and South Poles. Bridwell and Mugs Stump team up for a new route on the East Face. The famous, grueling dog sled race, won multiple times by Susan Bucher, and sponsored for the next five years by The North Face. Will Steger and team make a 550-mile, unsupported dogsled expedition to the North Pole. Tadpole tent hatches are introduced. Snow leopard pack launches onto the backpacking market. One of the most unusual The North Face trips ever, a special, unsinkable red rowboat takes Ned Gillette and crew across the tempestuous seas between Chile and Antarctica. Todd Skinner and Paul Piana live on El Cap for a month to free climb this classic Yosemite wall. Right at the end, Piana dislodges a boulder onto himself, breaking bones, but they top out triumphant with pitches as hard as 5.13. An international team of cold weather hard-men – Will Steger, Jean Louis Etienne, Victor Boyarsky, Geoff Somers, Keizo Funatsu, Qin Dahe – make the first unmechanized crossing, by dogsled, of the coldest continent: 4000 miles, seven months. Leading an all-female team, Magda King (Basque) reaches the 26,907-foot summit. The world's second highest, yet the hardest, mountain gets an oxygen-less ascent by Greg Child, Steve Swenson, and Greg Mortimer. Jay Smith and Scott Cosgrove brave 23 days of continuous storms to succeed on the steep rock of this peak's NW Edge. First ascent of this steep side of this Yosemite wall, by a paraplegic climber, Mark Wellman. Partnered up with the able-bodied wall-master Mike Corbett, the wheelchair bound Wellman devises a complex rope ascending tactic to follow Corbett up the wall. Jim Zellers and Tom Burt make the first snowboard descent of America's highest peak. Jon Krakauer and Dan Cauthorn persevere through the howling winds of the world's only inland ice cap to summit this shapely tower. "Just may be the coolest climb on the planet," wrote Krakauer in his now-classic Outside Magazine feature about the experience. Greg Child and Mark Wilford blaze a new route up the south face of the 20,500 foot peak. A massive, skyscraper-sized chunk of rock falls off right next to them during the ascent, wiping out the route, so they name the climb "Run for Cover." Helen and Bill Thayer travel a thousand miles by foot and canoe through the Amazon to research medicinal plants and lost tribes. A 4,000 foot new route on the ice-bound north wall of Hunter with Greg Child & Michael Kennedy. Americans succeed on a new route up the least visited side of the mountain. A landmark ride from the summit of this shapely 22,000 foot peak of Nepal with Jim Zellers and others. The original Dream Team gathering: a talent pool of The North Face climbers hit Kyrgyzstan and establish a bevy of technical climbing firsts in this range of fang-like granite spires. At one point Alex Lowe, Conrad Anker, Lynn Hill, Greg Child and Dan Osman are forced to flee the summit of a peak called The Bird, when an electrical storm sets their hair on end and their ice tools buzzing. Tom Whittaker, who'd lost his leg in a car accident years earlier, attempts the first disabled ascent via the north ridge. He reaches 28,000 feet, and returns two years later to become the first amputee to the summit. Not to be outdone, Mark Synnott and Jared Ogden establish their own first on Shipton, via "Ship of Fools," an equally impressive and hard won big wall route. Alex Lowe, Conrad Anker, Jon Krakauer explore this dramatic landscape of ice cap and razor-sharp towers, establishing a first on Rakheniven Spire. In their quest to climb the biggest wall on earth, Greg Child, Alex Lowe, Jared Ogden and Mark Synnott join forces for the 3800 foot sweep of this massive cliff, spending 20 days on the route. And then they found an even bigger wall! Jared, Alex, and mark spend the summer establishing a several-thousand foot route on the monstrous side of Great Trango Tower. Fought by storm and drenching melted water, their summit is hard won. On October 5, 1999, an avalanche on Tibet's 26,291 foot Shishapangma, the world's 14th highest mountain, took the life of Alex Lowe. Conrad Anker and Huber brothers take the challenge. Jim Zellers makes the first snowboard descent of Yosemite Valley's Half Dome, gliding down the 47-degree, 840-vertical-foot slope, on a skimpy three-inch snowpack - all of it poised above an overhanging cliff. "They were the most precise turns I've ever had to make. It would have been safer to BASE jump it," he said of his wild ride. Islamic Movement of Uzbekistan smashed by US forces in Afghanistan. An all-women's climbing and ski expedition with Kasha Rigby and Hilaree Nelson in Kashmiri snow peaks. Hans Saari, a ski mountaineer who has been on several The North Face expeditions, died May 8, 2001, after taking a fall while skiing in the Gervisuiti Couloir on Mont Blac de Tacul, in Chamonix. In the far southern hemisphere, where snow peaks rise virtually out of the ocean, Hilaree Nelson and Rick Armstrong climb and ski yet again. Brothers Will and Damian Benegas pioneer a new route up the icy north wall of Nuptse. 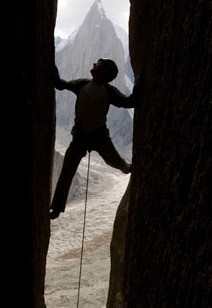 Their route "The Crystal Snake," is climbed in lightweight alpine style tactics. Those women again! This time they glide down the narrow and steep snow couloirs of this arctic wonderland. Kasha Rigby, Hilaree Nelson, etc. The US Board on Geographic Names (BGN) has approved a proposal to bestow the name "Alex Lowe Peak" on a mountain in the Gallatin National Forest. The commemorative name honors the late mountaineer Alex Lowe of Bozeman, MT, who had a unique association with the mountain (Peak 10,031) which was previously known by its elevation. Deep in the rainforest of this south American country is the finest quartzite climbing stone on earth. On this trip, Child, Ogden and Synnott reunite to make a new route on this 1500 foot wall, fending of cloudbursts, waterfalls, tarantulas and scorpions on their climb into this lost-world landscape. Radio and solar panel installation in remote town. Need details of this route with Kevin Thaw, Heidi Wirtz, Renan Ozturk, and Kris Erikson. School building project for Global Giving. Harald "Hari" Berger lost his life on the 20th of December 2006 while climbing in the Eiskapelle (Ice Chapel) at Hintersee in Austria. It appears Harald was climbing a glacial ice formation which fell down upon Hari at 2:15 local time. The formation fractured when an ice tool caused a "chain reaction", burying Hari under 150 tons of ice. Roping into caves where ancient Buddhist cultures hid their treasures, Pete Athans and Renan Ozturk lead archaeologists on a journey of discovery. The last of the spires in the Shipton Spire region falls to the team of Cedar Wright and Renan Ozturk. OK, this bit of history was not strictly about clothing as we normally list for company histories. However, The North Face is all about adventure and exploration. These are events that they feel are important to their history. Who are we to think differently... You can learn more about North Face at their website. North Face is part of VF Corp.
Return to the Fashion Company main page.